Is your business protected from cyber crime? What about you and your family? 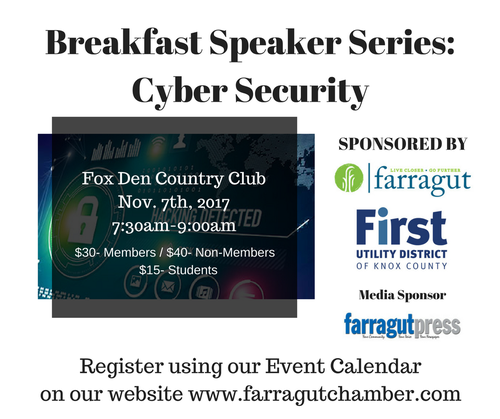 Join us on Nov. 7th for FINAL 2017 Breakfast Speaker Series: Panel Discussion on Cyber Security. The panel will feature speakers with perspectives from key areas of industry/manufacturing, financial/banking and public utilities. Each speaker represents a local leading business that is not only on the forefront of cyber-security requirements, but also protects tens of thousands of client records and sensitive customer data themselves. In the wake of the Equifax data hack and other major retailer/business breaches, and our increasing presence online, individuals and businesses need to be more vigilant than ever. Hear updates on current efforts and best practices, plus ask your own questions! Full Breakfast included. Each registration includes a donation to an area charity.